Do you suffer from sore, tense neck and shoulders, especially when you’re stressed? Do you have back pain that interferes with your day? Do you have a sports injury that throws you off your game and stops you performing your best? Do you require rehabilitation assistance to get you back where you need to be? Do you come home from work, shopping or the gym with aches and pains? If you answered yes to any of these questions, chances are a massage could help. But what is massage and how does it help? Remedial Massage is used to address specific problems with muscle pain and injury. It involves stretching and massaging muscles to inhibit muscle spasm, increase flexibility, break down scar tissue and increase circulation. Each massage is tailored to the individual’s needs. Remedial massage consultations involve exchanging information with the practitioner about your problematic area, assessment, diagnosis, treatment and then re-assessment. The best way to determine if massage will be effective for you is to come visit us and see the difference it can make; how it makes you feel, the change in your range of motion and mobility, and the way your body functions. 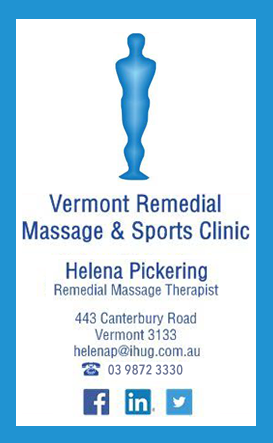 Hi, my name is Helena and I am the owner of Vermont Remedial Massage & Sports Clinic. For the past 9 years I have dedicated myself as a ‘common sense’ remedial massage therapist who is very dedicated to the effective care of patients. You’re not just a client you’re in need of attention! After completing my studies in 2007 (incorporating all aspects of massage including Sports Trainer Accreditation and Continued Education Practices), I along with the help of my family and friends opened my clinic. 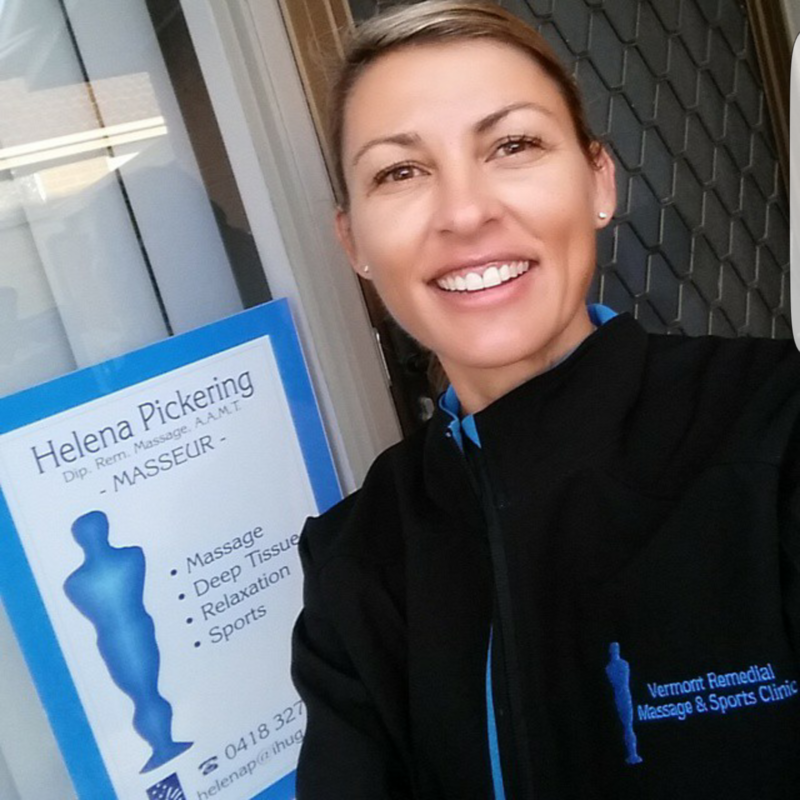 Over the years, I developed and continue to work with Local Community Groups, Elderly in nursing homes, the Eastern Football League Clubs and Cricket Clubs in both private practice and mobile massage. My biggest determination is looking ‘outside the square’ to treat those who experience all types of consistent and persistent aches and pains. I find that not only does massage reduce and repair muscle stress, but incorporating a stretching, relaxation or rehabilitation regime assists to alleviate the problem. The one niche I pride myself on is an assessment before and after treatment. This is essential in ensuring both practitioner and client see and feel the difference. It also ensures the quality of the treatment provided remains at its optimum. Pregnancy & infant treatments are a specialty. Youth growing pains and the Elderly with strains and aches, my healing hands await. Tradies, Hairdressers, and Teachers etc a great challenge. The corporately seated – bring it on. Weekend Warriors and Personal Trainers no worries! Also, I am a member of Australian Association of Massage Therapists, Sports Medicine Australia and Eastern Football League Trainers Association. So if in pain make an appointment today!